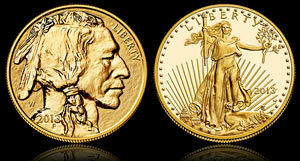 Last week the United States Mint cut prices on its numismatic gold coins. This week, on Wednesday, the bureau is poised to raise them in response to gains in precious metals. On the list of products expected to move higher is the new 2013 Reverse Proof Gold Buffalo. Prices for platinum coins should also climb. Before jumping into some pricing explanations, below is a grid with a list of products and their likely upcoming prices. Coin News Update: It took about 30 minutes longer than normal but the Mint on Wednesday did raise prices on its numismatic gold and platinum coins. New pricing is listed in the ‘To’ column below. When the U.S. Mint changes prices on its gold or platinum coins, it tends to freeze ordering for the affected products for about 30 minutes until the new prices go live around 12 Noon ET on Wednesdays. Every Wednesday morning, the United States Mint averages the daily AM and PM London fixings for gold and platinum back to the previous Thursday. When the average for gold or platinum shifts into a new $50 pricing tier shown in the Mint’s pricing tables, coin prices are adjusted. Current averages are well established into a higher tier of $1,300 to $1,349.99 an ounce for gold and $1,450 to $1,499.99 an ounce for platinum. It is these ranges that call for the higher coin prices. In addition to the averages, the Mint uses the Wednesday PM fixings for gold and platinum as a directional component. Each can, by itself, stop pricing changes. In this latest instance, coin prices will move higher unless gold plunges overnight by some $20 with the PM Fix below $1,300 an ounce and platinum drops around $45 with a PM fix under $1,450 an ounce. Will the mint be issuing five-star admiral coins? How about the six-star general and admiral?